Notes on Auckland Libraries, Sir George Grey Special Collections, Med. MS G.140, New Testament, probably Netherlands, late twelfth or early thirteenth century – by Alexandra Barratt and Alexandra Gillespie. This small manuscript is in a binding of highly polished, tanned brown leather over cushioned wooden boards (123mm x 85mm), attached to three cord supports for the sewing. (The upper board is currently detached). It is a sixteenth-century binding, though the lettering on the spine was probably added in the eighteenth. The book has an elegant brass hook-clasp fastening: on the upper cover is the catch plate; the anchor plate is on the lower. The short leather strap is broken; it has been inexpertly stitched up using blue thread. The clasp itself is of the type shown by J.A. 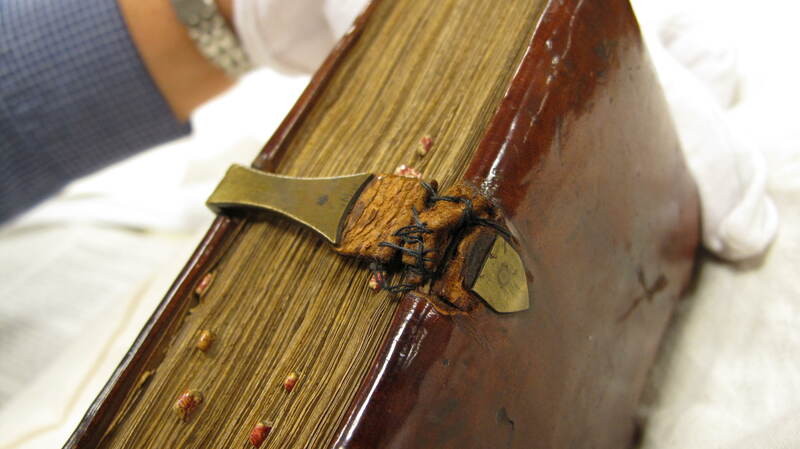 Szirmai, The Archaeology of Medieval Bookbinding, in Fig. 9.47 [b] and widely found in the Netherlands (though also exported from there). In addition the book has a set of contemporary red leather fore-edge book marks. The binding incorporates lower endleaves: a single bifolium from a medieval manuscript. The leaves contain two short texts. 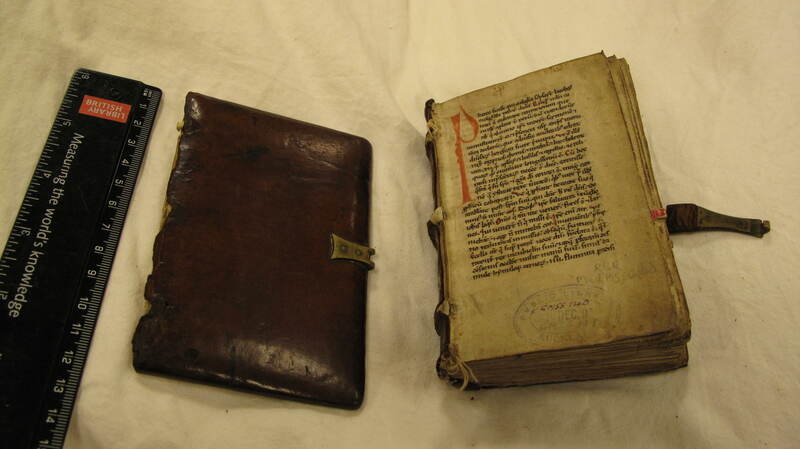 One is a Middle Low German text, possibly from the Rhineland of the late thirteenth or early fourteenth centuries; the other is a Latin text in a documentary hand of same period. The leaves are badly worn and in part illegible, but the former seems to be a passage on the Five Senses. 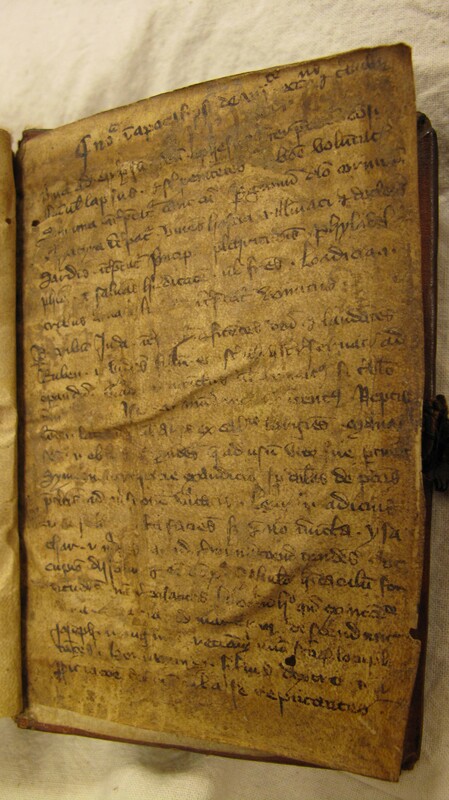 A similar text is found in Tübingen, Universitätsbibliothek, MS Md 277, inc. Daz sint die fünf sinne (see Heinrich Adelbert von Keller, ed. Eduard Sievers, Verzeichnis altdeutscher Handschriften (Tubingen: H. Lauppschen, 1890, repr. Hildesheim and New York: Georg Olms, 1974), p. 57. Enumerations of the Five Senses, and the sins to which they are prone, are common topoi in medieval pastoralia: for a discussion of some in Latin and Middle English, see Alexandra Barratt, “The Five Wits and Their Structural Significance in Part II of Ancrene Wisse,” Medium Aevum 56 (1987), 12-24. The Latin text is short: it lists allegorical interpretations of the names of the Seven Churches (Apoc. 1:11) and of the Twelve Tribes of Israel (Apoc. 7:7). Most of this material derives from Rupert of Deutz on the Apocalypse, some is from Hugh of St Cher, and much of it but not all also appears in the Glossa Ordinaria. Both the Latin and vernacular texts are ones that an educated parish priest might plausibly value for pastoral work. For a full description of this manuscript including its binding see Margaret M. Manion, Vera F. Vines, and Christopher de Hamel, Medieval and Renaissance Manuscripts in New Zealand Collections (Melbourne, London and New York: Thames and Hudson, 1989), no. 19: our work repeats key details from and then supplements their account. See also Kerr, “Sir George Grey and Henry Shaw,” in Migrations: Medieval Manuscripts in New Zealand, ed. Stephanie Hollis and Alexandra Barratt (Newcastle: Cambridge Scholars, 2007), 59. As suggested by Manion, Vines, and de Hamel, Medieval and Renaissance Manuscripts in New Zealand Collections, 59. (Farnham: Ashgate, 1999), 253 (see also Table 9.16). Thanks to Ed van der Vlist, Curator of medieval manuscripts at The Hague, Royal Library, for this reference. Figure 1, Auckland Libraries, Sir George Grey Special Collections, Med. MS G.140, binding showing detached upper board. Figure 2, Auckland Libraries, Sir George Grey Special Collections, Med. MS G.140, brass hook-clasp fastening and fore-edge book marks. Figure 3, Auckland Libraries, Sir George Grey Special Collections, Med. 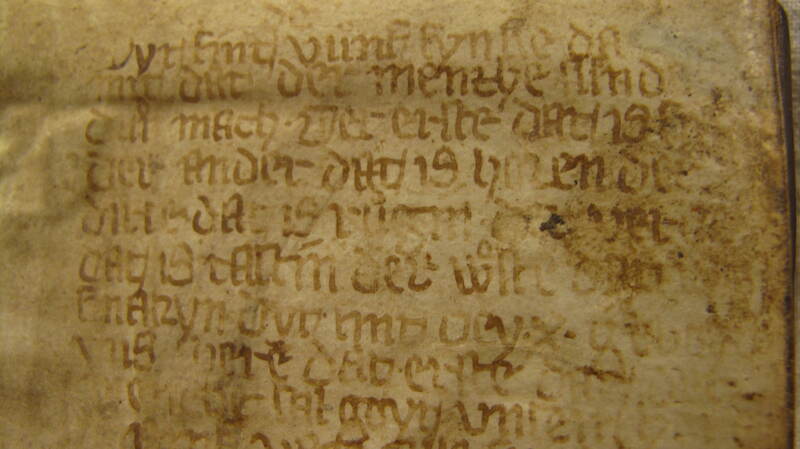 MS G.140, lower endleaf, vernacular text on senses. Figure 4, Auckland Libraries, Sir George Grey Special Collections, Med. MS G.140, lower endleaf, Latin text on allegorical interpretations of names. The vernacular text on the five sences (“Dyt sint vůnf synne”) is definitely not Dutch, but German. For a 15th-c. version cf. Heinrich Adelbert von Keller, Verzeichnis altdeutscher Handschriften (Tubingen 1890; repr. Hildesheim 1974), p. 57, no. 27. Thanks very much. I’ll follow up the reference you suggest and see where it leads.